David, one of our committee members, has been researching the history of Northampton’s cycling clubs. Here he republishes a 1923 article about the Cyclists’ Touring Club Northamptonshire District Association. It comes from the Northampton Independent, a weekly newspaper which ran from 1905 to 1960. It It was written by Mr B Clowes who was based at 5 Castilian Street. The editor described him as “the assiduous Hon Secretary” of the association. The Cyclists’ Touring Club popularly known as the C.T.C. was formed as far back as 1878, and in those early days of cycling laid the foundation of those rights and privileges which cyclists enjoy to-day. Amongst the objects of the Club are the defence of cyclists’ rights, provision of special touring facilities, promotion of legislation for cyclists, publication of road books and maps, scheduling of hotels and refreshment houses (with tariffs), appointment of official repairers, insurance of machines and riders, and the supply of cycling information. The Club has a paid secretary and office staff located in Euston Road, London. Here there is a reference library and touring bureau, from which members who apply are supplied with routes and the latest information regarding the district in which they propose to tour. The Club has in various parts of the country local representatives, or consuls, as they are called, who are always ready to assist and advise all cycling and touring members generally. So far as continental travel is concerned, the Club has reciprocal arrangements with the Continental Touring Clubs. Amongst other things the Club gives legal assistance to cyclists, issues a very fine illustrated monthly gazette (worth the subscription alone) and publishes an annual handbook. For fostering local interest amongst members there are a large number of district associations which are in themselves complete social cycling clubs. The Northants District Association is one of the youngest and is now forging ahead. It is managed by a local committee, who are at all times willing to give careful consideration to matters appertaining to cycling brought to their notice by members. Club runs are arranged for Thursdays, Saturdays, and at holiday times tours are arranged. During the time the Association has been in being, runs have been held to many places of interest in this and neighbouring counties, and many pleasant hours have been spent at joint runs with other Associations. Ladies are eligible for membership, and we have several regular lady riders. We have no hard and fast rules, the runs being “free and easy”, and there is an air of sociability and good fellowship throughout. There are those who say cycling is hard work, but these are the people, one imagines, who never tried anything but a “dreadnought” and perhaps even then never gave their bicycle a chance to make the acquaintance of an oil can. With a light machine, kept in proper trim and a reasonably low gear, one can comfortably cover a century a day. We have met on some of our joint runs members who were doing considerably more. We are an all-the-year round cycling club. The bicycle has enabled us to get about this delightful county of ours (which as not so flat as some people think) in all seasons. We have revelled in her Summer and Autumn glory, and we have enjoyed the sombre beauty of her Winter. We have found one hundred and one beauty spots in this and neighbouring counties, and have drank of their beauty to the full. We have enjoyed the expansive views of the Cotswolds. We have meandered along the pretty lanes in the Thame Valley. We have seen the gorgeous scenery of the Wye, and some of us have ridden to the majestic scenery of North Wales. We have a host of delightful memories of this country of ours. All these pleasures and many more are open to the cyclist, and to belong to an organisation such as ours means congenial companionship in addition. There are numerous beauty spots in and around the outskirts of the town with which a large number of cyclists and other lovers of the open road are totally unfamiliar. 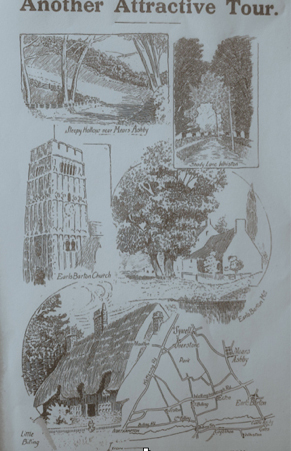 Northampton in 1860, it contains a number of inscriptions to ancient families. At Easton Maudit dwelt Thomas Percy, author of the “Relique”, who entertained many famous literary men at the vicarage, including Goldsmith and Johnson. Dr Johnson spent several weeks here. We now go to Grendon to explore the beauties of Castle Ashby park and village; then return to Northampton through Cogenhoe. Another good journey for the cyclist and a pleasant spin for the motorist is to be enjoyed in the Mears Ashby and Earls Barton districts shown on the map. Leaving by the Billing Road, we pass on the left Abington Rectory, where Sir Douglas Haig used to visit as a boy when his uncle was rector, and soon reach Little Billing. 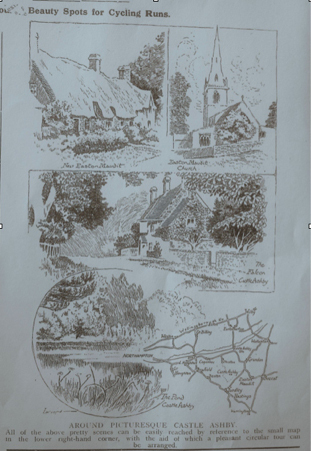 Here are picturesque cottages, a church with a Saxon front, and the remains of a 14th century Manor House. Billing Bridge – said to have been the scene of a fight in the Civil Wars – is crossed, and a climb takes us to Cogenhoe. The origin of this name is Gucken, to spy and hoe a hill. Further on Whiston, a very pretty village, is worth visiting. At Castle Ashby gates turn to the left and cross the railway line and river. Earls Barton tower is the next landmark. The “most characteristic piece of Saxon work in the land,” it is 1000 years old. Cross the Wellingborough Road and proceed through pretty lanes to Mears and Sywell. In Sywell Woods, Captain Thompson, a Leveller mutineer who broke open Northampton Gaol in 1649 and robbed the public coffers, was rounded up and, after a bitter resistance, killed. We pass through Overstone and return on Kettering Road. It is said that from a hill between Overstone and Great Billing forty-five churches can be seen. The panorama is certainly superb. Those who desire a pretty walk should take the bus to Ecton, walk across the fields to Cogenhoe, and return by train from Billing station. Five of us set off on a hot sunny afternoon on a loop from Moulton through Sywell, Mears Ashby and on to Great Harrowden, Orlingbury, Old and Scaldwell before stopping at Brixworth for coffee and cake. We closed the loop and returned to Moulton by skirting the reservoir and shredded one of our tyres in the process – sorry Tim! That section of path is getting a little too rough for “racing” tyres. Lovely afternoon on the bike and good to have a new rider on the trip with us – see you next time Jim! David, one of our committee members, has been researching Northampton’s 19th -century cycling clubs. He has unearthed some remarkable photographs. 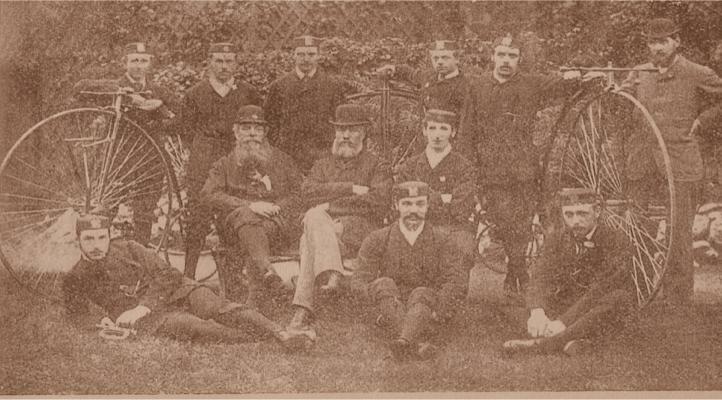 This is the St James Cycling Club pictured at Franklin’s Gardens in 1898. Seated on the wooden chair in the centre is the Club President, Edward Lewis (boot and shoe manufacturer and Mayor of Northampton in 1903). The bicycles have no brakes as these were racing machines. Cycle racing bicycles took place on the County Cricket Ground and on the Racecourse. The position of the bugler was an important and honoured office to hold within the club. During road runs a bugler usually rode either at the side or immediately behind the Captain (it was a strict rule that the latter led the outings and must not be overtaken). By means of bugle calls he relayed the Captain’s instructions to the other members lower down the line. 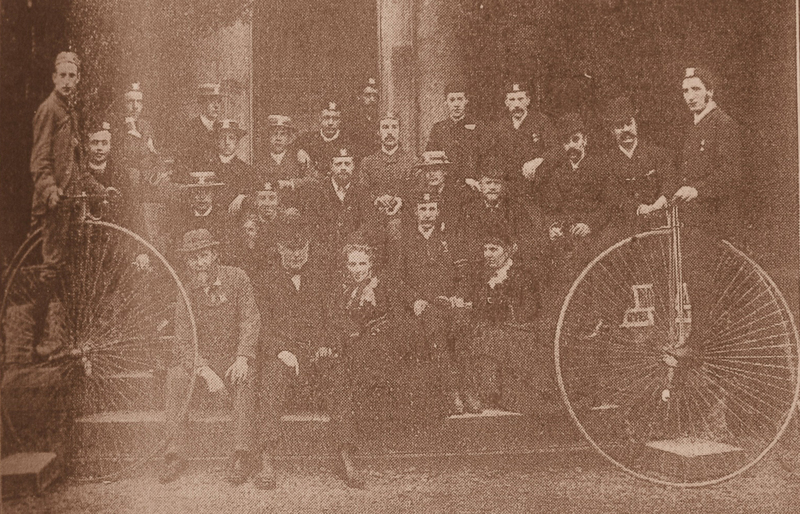 This is the Northamptonshire Bicycle Club which counted James Manfield, E J Allchin and T P Dorman among its riding members, paying a subscription of 15 shillings a year and wearing – on penalty of relegation to the rear of the column – a uniform of dark green Norfolk serge shooting jackets and breeches, stockings and black polo caps. Front row – Mr Daniels (sen) Mrs Clifton (wife of the late Dr. Clifton), A. J. Jowett (Captain), Mrs Jowett. And here is the same club – on a Whit Monday in the 1880s – at the Jepson Gardens in Leamington. The run had started at 8.00 a.m. from the George Hotel in Northampton town centre (now the site of Lloyds Bank in George Row). In Leamington, the riders met with other clubs for a parade to Warwick where a silver bugle was presented to the club with the best muster … the Northampton Club! The participants rode 54″ “ordinary” bicycles, like the two in the photograph. W J Hull, the borough accountant was thrown from his machine just before Southam and suffered a damaged shoulder. This did not prevent him completing the ride! 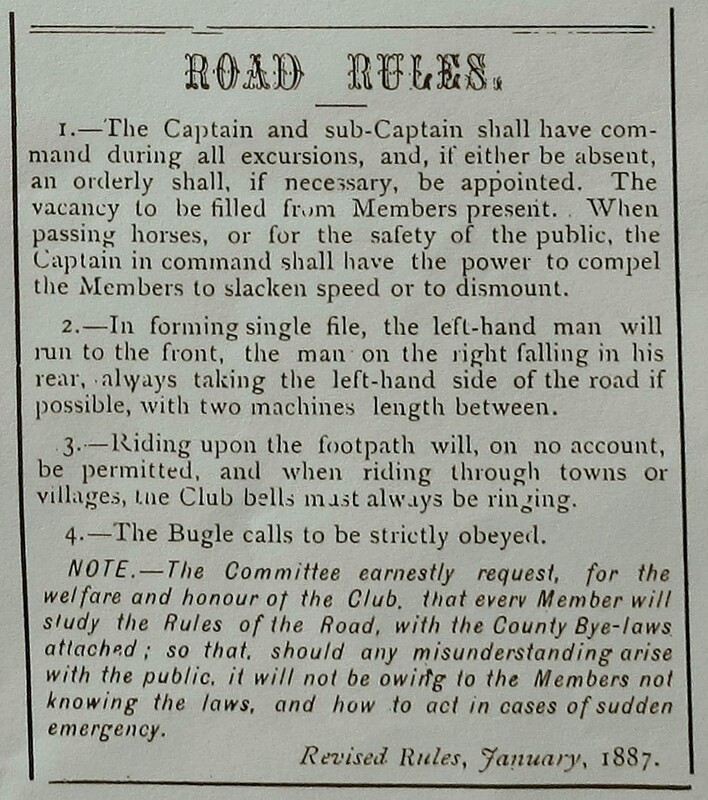 These are the rules of the Victoria Cycling Club – for “gentlemen amateurs” (Joseph Grose was a member). They sported a navy uniform with a silver shield and the fees were a more modest seven shillings and six pence. Members of the College Street Cycling Club – whose committee included W T Church the proprietor of the the glass firm – paid only one shilling and dispensed with uniform at the instigation of working men. The clubs, however, were largely male affairs (except for the Northampton section of the socialist Clarion Club) and when on the road they demanded military-style obedience. The signals of the bugler (working men’s clubs used a whistle) were to be instantly observed; no matter the wealth or status of his fellow, the authority of the Captain reigned supreme! A glorious and cloudless sunny morning was the reward for the six riders who set off from East Hunsbury to Pitsford Water near Brixworth, including first timer Liam and occasional CTC rider Giles. ride. Skirting Hunsbury Meadows we headed for Rothersthorpe and a couple of early inclines to raise the heartbeats of the group. Cruising towards Kislingbury got the riders warmed up in the wonderful morning sun before making our way towards Harpole on the safe cycle path alongside the main A4500 road. The short sharp climb out of Harpole provided the first real test of the day but everyone climbed admirably. A short run along the Roman road at the top led to another off road stretch on the near perfect cycle paths towards Harlestone before taking the road option again past the garden centre. Another fast descent beckoned past the Fox & Hounds on the smooth tarmac giving us momentum up the other side and the turn towards the Bramptons. More fast descending and climbing followed towards The Windhover and eventually up to the main Market Harborough road ahead. Two more fast downhills and long climbs lay ahead before the arrival into Pitsford and we were all grateful to see the signs up ahead. Eleanor had already secured a table for us all and we joined her for refreshments in the open air. After a very pleasant stop, five of us headed back whilst Eleanor and Brian made their own way home. The first downhill out of Pitsford was accompanied by a sudden headwind, coming out of nowhere, making the subsequent climb that little bit harder to make. The second dip was avoided though as we turned right towards Brampton Halt where new boy Liam took the helm with a turn of pace to the Northampton Road junction. At this point Phil L branched off leaving a team of four to continue. The road went upwards again before the rewarding dash down through Church Brampton and back past the Fox & Hounds for a second time. Upper Harlestone was next en route which looked picturesque in the morning sunshine. We meandered our way through the village and onto the Roman road again where a headwind hit us immediately, just as if the gods had seen us coming! We moved swiftly though and were soon turning for the exhilarating downhill into Harpole which would be the last on the ride and one to enjoy. Pineham provided more smooth off road riding over to Hunsbury Meadows. The final climb to the finish went up Hunslet Lane for a change, a shorter sharper rise than the usual route we normally take and caught some of the group by surprise. A quick dip before another rise completed the climbing and the morning’s ride. Five riders gathered at the Canoe Centre on the same morning that six of the club were taking part in the annual Ride London event. So not a bad turnout on a promising day weather-wise. First stop was Little Houghton and an early climb to get the heart pumping. Towards Billing we spotted the campsite of the annual Land Rover show along the way. A plethora of Land Rover vehicles on the road was evident as we headed through Billing for the tricky right turn up ahead. The village of Ecton came next which had new tarmac laid up most of the main street helping us up the slight gradient. A little further on BBQ smells emanated from the World’s End pub as we passed the junction according to Milton but we couldn’t stop – we had a ride to complete! A fast downhill past Sywell Country Park got the heart going again as did the long haul back up the other side to the main road towards Mears Ashby. Before long though we were cruising at decent speed with nothing but golden fields as far as the eye could see until we finally hit civilisation again in the form of Little Harrowden. Quickly out and climbing, more remote lanes provided a pleasant experience for the group with just the odd vehicle to be aware of. The landscape then changed through Finedon and Burton Latimer as we weaved our way through the urban streets and alongside the majestic wind turbines in full flow nearby. Over the A14 we soon entered Cranford and Cranford St Andrews a little way beyond. At the vibrant cafe (The Old Forge) we met Eleanor who was already enjoying food and drink and we duly joined her. Once refreshed we all retraced our steps back to Burton Latimer and right into a head wind. Turning towards Isham was no benefit to us whatsoever and clearly it intended to follow us all the way home. company and went their separate ways leaving a group of four to head back. to get easier on the legs. Holcot approached with our leader looking for a way to Sywell and the roads duly obliged with a sign or two. The wind seemed to have picked up speed again at this point as did most of the drivers on the busy roads we were now on but we battled on regardless. The anticipated route back through Ecton didn’t disappoint. It was swift and smooth and propelled us towards Billing again. Land Rover mania was still on-going making the route on to the cycle paths a little more precarious than usual. At Riverside four became one as I rode back alone to the Canoe Centre whilst everyone else made their own way home. Sterling work from Milton at the head of the pack and for providing a beautiful ride.